There's sure to be plenty of sparkle in the air this holiday season as THE RADIO ROSIES load up their sleigh with sweet harmonies and delicious musical delights. Morgan Evans, Elizabeth Novacek, and Catherine Hannah Davis create a tasty vocal confection of swing, jazz, and boogie-woogie that pays tribute to the timeless standards popularized by The Andrews Sisters, The McGuire Sisters, and other musical legends of the '30s, '40s, and '50s. Also on the menu will be a generous serving of savory seasonal treats such as "Winter Wonderland," "Let It Snow," and "I'll Be Home For Christmas." 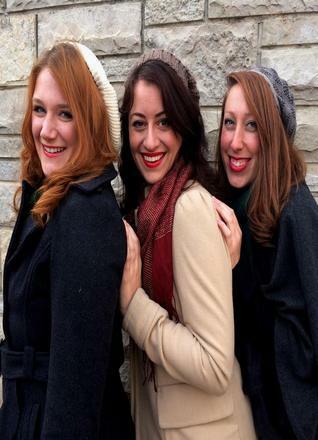 Accompanied by a fabulous back up trio, THE RADIO ROSIES will bring back happy memories -- and create some new ones, too! Join us for a holly, jolly, jingle and jive with these charming and talented holiday belles!